which intel hardware for hevc decode? just haswell? The driver 3621 can be used by Ivy and Haswell, so both platforms should be supported. It seems though, that there are some restrictions. For example, my Haswell Pentium G3420 with Intel HD graphics, doesn't have HEVC support. I bet the same for HD 2500 Ivy iGPU processors. if i set the output of the decoder as RGB32 which is the algorithm of the chroma upsampling? i have some disallineaments and diagonal lines are a litte jagged. RGB32 output uses simple bilinear upscaling. Its meant to be a fast fallback alternative at OK quality if you need RGB32 for some reason, not the absolute best quality. Its usually better to leave the conversion to your renderer, since it can perform it much faster in potentially higher quality on the graphics card. I did take care to perform the conversion properly (in high bit depth, and with dithering), however the algorithm remains limited to bilinear. Is there a way to instruct LAV Splitter to select a specific audio track (irrespective of preferred audio languages in the settings of LAV Audio) when opening an MKV in MPC-HC? Does LAV Filters inspect the command-line arguments of the player it was created in? Please can somebody help me with this? I have a problem with lavvideodecoder 0.61.2 used like standalone or with lavfilter included internally in mpc-hc. edit: The problem arrives if I use ffdshow raw filter with lavfilter 0.60.1 and 0.61.2 (The problem arrives with only some videos, not all video). 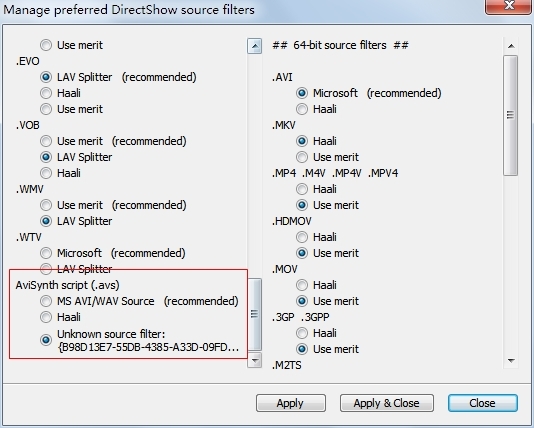 If I use lavfilter 0.59 with ffdshow raw filter, there is not problem. How solve this problem ? Last edited by ikarad; 9th June 2014 at 14:32. Sorry, I know this must have been asked about a 1000x times here, but I keep finding contradicting information on the internet. When using a classic stereo "full-range" speaker setup (like people have been using to listen to music for 50 years), what is the recommended downmixing settings? Should LFE be 0.71? Why is it 0 on default? Isn't it cut at somewhere around 80-100 Hz? Every single decent stereo system can go way lower then 80 Hz, without any dedicated subwoofer. I think 20-25 Hz is normal for proper speakers. Also, should surround be 1.0 or 0.71? First of all, 20-25Hz is certainly not typical for full range speakers, which usually stop near 40-50Hz. A full range speaker that goes all the way down to 20Hz is typically very expensive, and usually takes the form of a normal speaker combined with a subwoofer in the same box. Second, even if the speakers are able to go that low, it doesn't mean they're able to handle lots of output at these frequencies without producing significant distortion (clipping). LFE is meant to carry loud to very loud low frequency sound effects, which are reproduced very poorly by typical speakers or even cheap subwoofers. This is why 0 is the default for downmixing LFE in LAV Audio: the rationale is, people who want to downsample to stereo probably don't have what it takes to reproduce this very low frequency, high output content. For the standard downmixing levels for LFE and Surround, see ITU-R BS.775 which is very clear and even has a whole section dedicated to explaining how LFE works. Page 11 states that the proper downmixing coefficient for surrounds is 0.71, while it can be deduced that the proper coefficient for LFE (if you want to retain it) is +4dB (+10dB as stated in paged 14, -6dB because of two channel coherent acoustic summation at low frequencies), or 1.58. Last edited by e-t172; 9th June 2014 at 19:06. Thanks, I've looked into that document you've linked. But still what is the "recommended" value for LFE for a normal stereo system, isn't 0 and 1.58 a bit of an extreme? I mean isn't it reasonable to take a bit of LFE, like 0.30, which still doesn't over-power the speakers but helps a bit with lower freq sounds? Well yeah, since 0 and 1.58 are both acceptable values, it follows that any value between the two would be acceptable as well. It would be purely arbitrary though, since there's no easy way to calculate an "optimal" value. nevcairiel, now that MKVToolNix 7.0.0 has been released which fixes what are hopefully the final major muxing bugs with CueDuration and CueRelativePosition, what are your thoughts about John Peebles's patch which he posted a few weeks ago to Issue #302. As mentioned there, it may make sense to have him remove the partial workaround for MKVToolNix <=6.9.1, so the patch only contains the fully complaint implementation. Either way, it would be nice to see this long awaited functionality make it into your next Lav Filters release. Would you please make it known to be lav splitter? does this have something to do with switching to a chapter in the middle of a subtitle line that's not show at all? Yes, CueDuration and CueRelativePosition splitter support enables perfect subtitle seeking with embedded subtitles, comparable with external subtitle seeking behavior. If you care about this, you should start muxing all your MKVs with MKVToolNix >=7.0.0 for future proofing. Also noteworthy that a simple remux of existing MKVs will rewrite the Cues, fixing bugged CueDuration and CueRelativePosition entities from MKVToolNix <=6.9.1, so it shouldn't be too hard bringing older MKVs up-to-date. I haven't had time to look at the patch yet, only briefly browsed through it. But in general hacks for old versions are bad. And if someone wants to help, teach him about github pull requests, that makes it so much easier for me when I find time to look at it. Forgot to push the ffmpeg repo, apparently. All fixed. Mostly pushing this release to get updated ffmpeg libraries out, as well as not cause the new things to rot too long. As it appears, the WMV9 DMO decoder is kinda broken on Windows 8.1, it doesn't properly identify interlaced videos anymore, which causes them to never engage deinterlacing. To solve this problem, I've implement a new wrapper around Microsofts decoder, using the MFT (Media Foundation Transform), instead of the DMO. DMOs are a tech from Windows XP and before, and are really old and deprecated, while MFTs are new and clearly better supported - plus getting the information I need out of it was actually quite a bit easier than with the DMO before. Note that this has no influence on anything DirectShow, LAV is not a Media Foundation filter all of the sudden, it just happens to use the WMV9 MFT, nothing else changes. Anyway, have fun, and as always report any regressions you find.